Spot the Moon and Saturn Together Tonight! Overnight on Wednesday, August 2 the waxing gibbous moon will sit only three degrees to the upper right of yellowish planet Saturn. This evening (Aug. 2) brings another opportunity to identify what many consider to be the most beautiful of all telescopic objects: the ringed planet Saturn. As we have noted previously, as it appears to the naked eye, Saturn does not present any outstanding features. It lacks the dazzling, eye-popping brilliance of Venus or Jupiter, and it does not have the fiery orange-yellow color of Mars. In fact, to the naked eye, Saturn appears to be nothing more than a very bright "star" that shines with a yellowish-white glow. 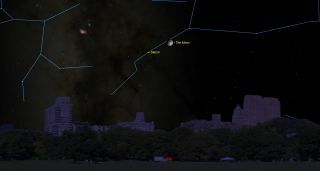 People looking around the current summertime sky might take note of Saturn while gazing toward the southern part of the sky about an hour after sundown. But they might be attracted even more to the star Antares, the brightest star in the constellation Scorpius, the Scorpion, which is placed well to the lower right of Saturn. Although it shines only about half as bright as Saturn, Antares is one of the most colorful stars in the sky, shining with a distinct ruddy hue and likely twinkling compared to the steady and sedate Saturn. Earth's nearest neighbor in space will be situated about 5 degrees to the upper right of Saturn. If you own a telescope, Wednesday evening will likely be a great night to invite your friends and neighbors over to peer through your eyepiece at these two wonderful night-sky objects. First, check out the moon. In fact, now is the best time to look at it — not, as many believe, when it is full. A full moon looks "flat" and one dimensional, and its brilliance may dazzle the eye. But tonight's moon is 80 percent sunlit and shines about one-third as bright as a full moon. Check out the region along the terminator, that part of the moon that separates the light zone from the dark zone. Especially in the lower part of lunar disk, you will see many craters casting shadows which will make them stand out dramatically in sharp relief. You won't see these features on a full moon. And relatively close to the terminator are two of the moon's brightest visible craters. On the lower part of the moon is Tycho, with streaks of brightness radiating out from it in all directions, giving it the appearance of sunflower. And higher up, you'll see another crater with fresh, bright material radiating from it: the so-called "monarch of the moon," Copernicus. Right along the terminator in the moon's upper left portion, you will see a crescent-shaped domain of beauty: Sinus Iridum, the "Bay of Rainbows." This crescent is formed by the Montes Jura (Jura Mountains); here, the highest mountains rise to over 20,000 feet (6,000 meters). This evening, the peaks of this range will catch the light from the rising sun at their tops. This will produce a string of bright points that have been described as the "jeweled scimitar" effect. After you finish showing off the moon to your friends, it will be time to turn your telescope toward Saturn. Your clenched fist at arm's length is equal to roughly 10 degrees across the night sky. So Saturn will be situated about "half a fist" down and to the left of the moon. Any telescope with an eyepiece magnifying to at least 30 power will show the planet's famous ring system. Currently, the north face of the rings is tilted almost as far as it can get, an inclination of 26.8 degrees. The outer edge of the rings can be traced completely around the back of the planet, while the front of the rings hides the southern or lower part of Saturn's disk. Astrophotographer John Chumack sent in a photo of Saturn taken on March 29, 2013, from his home in Dayton, Ohio. And don't be late setting up your telescope to view Saturn and the moon. They'll start sinking toward the southwest fairly soon after twilight and will have set before 2:30 a.m. local daylight time. A final "gee-whiz" fact you can tell your friends: What you will see in tonight's sky is an illusion of perspective. The moon and Saturn are nowhere near each other in space. The moon will be 251,700 miles (405,000 kilometers) from Earth, while Saturn is 3,333 times farther away, at 869 million miles (1.4 billion km).